How can I make Everthing to check for updates at start up? 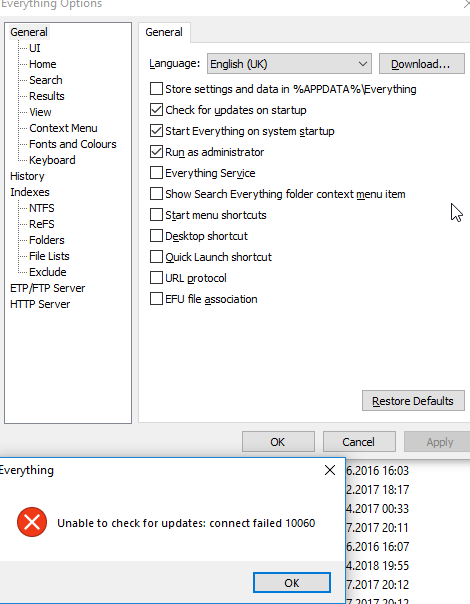 Re: How can I make Everthing to check for updates at start up? I suspect this has something to do with the recent connectivity issues. Indeed, it is working now, thank you. Although I ran respectivel had run an old Everything version because I never had any update messages. So it seems as if there is no automatically checking working with my Everything generally. Thank you for the link. What a coincidence, just today I am checking the updates the first time after a very long time. [...] because I never had any update messages. So it seems as if there is no automatically checking working with my Everything generally. Oops, quite comprehensive, many thanks for the link. So the best is just to wait, I assume.